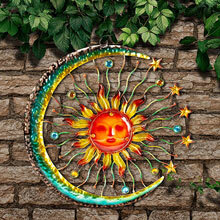 This unique Sun and Moon wall decor is the perfect accent for any room. 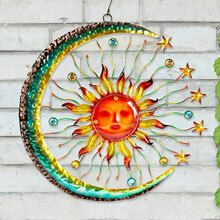 With it rich colorful metallic finish accented with faux gems and glass sun face this highly artistic wall accent is sure to brighten any space. 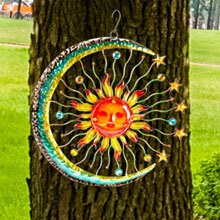 Complete with hanging S hook at the top, this celestial wall decor is ready to hang and enjoy. 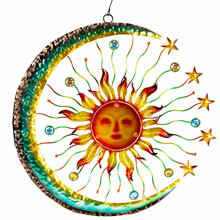 18"wide, 17" high with 3" high hanging hook. 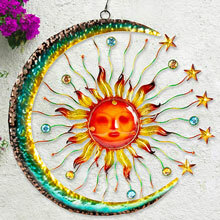 •WHIMSICAL AND FUN DESIGN: Brilliantly colored metalwork frame is accented with faceted faux gems and a bright dimensional orange glass sun face in the center. 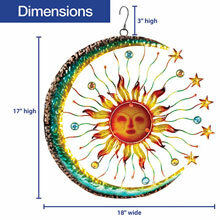 •PERFECT SIZE: Made from strong metal and glass and measuring at 18" wide, &frac25;" deep and 17" high, complete with a 3" high hanging hook, making this the perfect wall accent indoors or out. 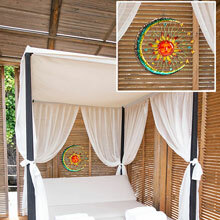 •READY TO USE: Large S shaped hanging hook attached to the top makes for easy hanging; for indoor or outdoor use. 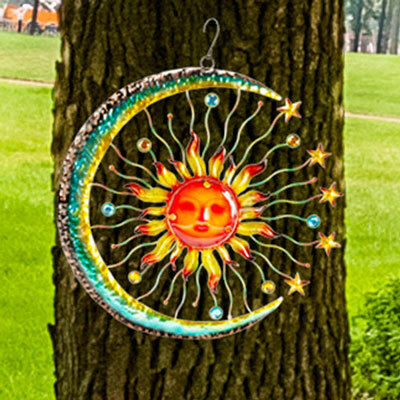 •CREATIVE DESIGN: Translucent colored glass sun face and richly hand painted metal complements this celestial piece perfectly. 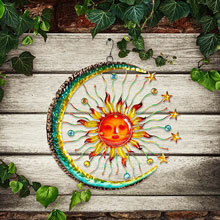 •GREAT GIFT FOR: Spiritualist, nature lovers, house warming, birthdays and more.